Emily Freeman has posted her What I Learned linkup and I’m ready to think back and see if I learned anything new in November. It would be a terrible waste of 30 days if I didn’t. College football is so much more fun and engaging than pro ball. My daughter, two grandchildren, and I have been a traveling band of four for about 13 years – road trips are our specialty and we have learned to do them well. We headed to Lynchburg, VA on a very rainy November morning for the last home game of the Liberty University Flames. Kickoff was 3:30 and we made it in time for a quick stop in the campus book store and over to the hotel to get checked in. In full rain gear we headed to the field. In spite of a wet first half of the game, we had a ball. The game itself was excellent, complete with fireworks and shooting flames over the locker room every time the home team scored! The halftime show was a tribute to the military, complete with a surprise reunion of a soldier and his family. The sky cleared and the temperature dropped in the third quarter. It was another successful trip for the weekend marauders! Anniversaries get better on the other side of 30! We celebrated 31 years on the eleventh and it never ceases to amaze both of us we survived and we’re “still crazy after all these years!” This anniversary even brought roses to the table! Terrorism hurts even when it’s not in your own country. Our hearts grieved for the loss of life in Paris, France. This is not a new lesson, but a reminder of the blessing of friendship – my Tennessee friends and I met for our quarterly girls’ luncheon, we laughed until we cried, ate wonderful food, and did I say, we laughed? Fair Trade items are the way to go. To purchase beautiful, hand-crafted items knowing the money is going to help an orphanage in the Nuba Mountains of the Sudan? Is a wonderful thing. I love the process of creating a book. To write the words, format the pages, edit and proof, it is what I love to do. 31 Days in Proverbs is now a “real” book! Thanksgiving is never a disappointment and there are always new questions to keep a family around the table long after the eating is done! I learned how to make Palmiérs. Thank you, Ina Garten. I am linked up with all the blogs you see in the sidebar on the right! Your new(er) web design is nice. Learned lots in November. Too long a list to add it here. But, this one thing stands out: Family. We spent four days in Cary with our son & family. It was wild, crazy, loud (very loud), some tears, lots of laughter, and thankfulness in bunches. So very “thankful” for our family. They make the circle complete. Hi Susan! I am so glad to be your linky neighbor at both Jennifer’s and Holley’s today!! Agreed! College football is far more engaging than Pro ball. We all grieved and prayed with you for Paris. And Congrats!!! on your book!!! YAY!!! Much love and blessings to you sweet friend! I couldn’t pick a better neighbor!!! Thanks Danise! I enjoyed your blog and your” PS blog “also. Feels good to keep in touch and looking forward to seeing you at Christmas time! Yes, we will definitely be around Christmas! College football is my fave too…especially my beloved Nebraska Cornhuskers! (Sorry Melissa!) And yes, terrorism always hurts! College football is way better! What a great list, from the everyday to the spiritual, from recreation to the practical. Congrats on your Proverbs book! Constance – thank you for visiting and your kindness. Oh! I never imagined you to be a college football fan! What fun, though, that you get to bond with your family doing something that you all enjoy :). I’m still working on more than mere tolerance amongst my family members for bird watching ;)…it’s probably never going to happen with my husband, but my daughters see it as a great opportunity to wander around and talk to me :). I am a required college football fan – Hannah is attending L.U. in January so I’m gearing up!!! I would like to birding with you one day! 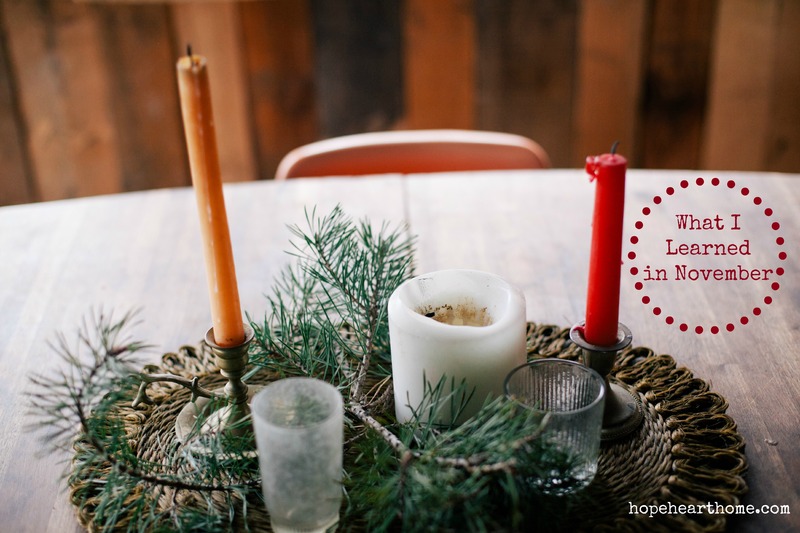 Hi Susan – your neighbor at Women With Intention this week. You learned a lot. For me it’s been a lot of study walking thru Unglued by Lysa Terkeurst and The Battle Plan for Prayer, and so much more like slowing down this Christmas. I’m already behind but doing important things like watching grandsons. Going slow is giving me time to savor it all. We never know when it’s our last. I’m loving December because of what God has shown me in November. Loved your post. Terriosim will always be sad.